My husband is an IT person (he has his own IT business). And this means he is constantly researching new technology. He loves technology. I, on the other hand, am typically suspicious of new technology. The history of our (IT) relationship has been one of my husband dragging me along towards new technology and innovation. He basically has to buy it for me and once I start using it, I absolutely love it! So I’m not “against” technology – I’m just not going to be the first one to go out and get the newest thing. My husband has been fairly successful with his approach of putting the technology in my hands and me realizing I love it. Currently, I own a very large smartphone (I call it a Phablet – tablet and phone rolled into one). It’s a Samsung Galaxy Note 4 (with a 5.7″ display). My reasoning was that I couldn’t justify owning a tablet and a phone when I would use them for the exact same things (other than making phone calls). I use my phone for everything. Now that I’m writing so much I thought I’d try blogging from my phone (I have the WordPress blogging app). But typing on a phone keyboard (even a big phone) isn’t very convenient. 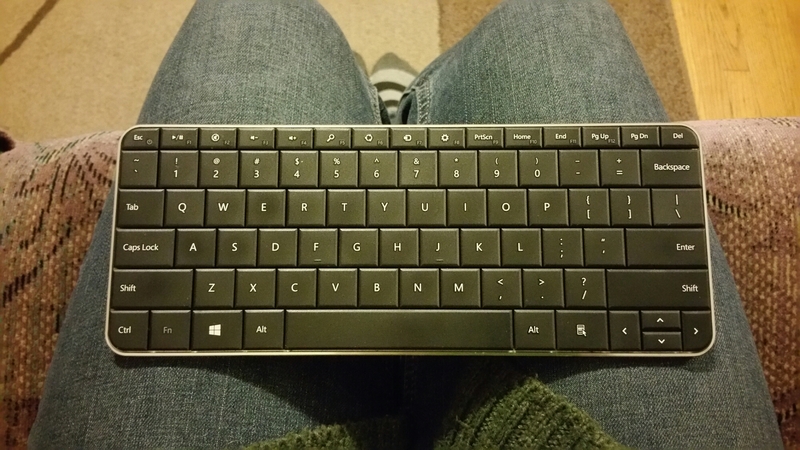 So tonight I grabbed my husband’s compact bluetooth keyboard, paired it up with my phone and typed up this post. It works pretty slick! I do like it when technology enhances my life (which is the case most of the time, I just don’t realize it until I actually try it – which takes some coaxing). Leighton tells me you can pick one up at Costco for $20.